Hugged by the dunes of Cahoon Hollow Beach, the “Comah” has weathered winter storms since 1978, reopening every Labor Day to Memorial Day to a crush of Cape visitors. The only oceanfront beach bar and restaurant on Cape Cod is known for its lively lineup of surf-rock, reggae, and cover bands—and for having the best raw bar this side of Cape Cod Canal. “Beers on the beach” is taken to a whole other level at this brewpub in the shadow of Oregon’s famous Haystack Rock. 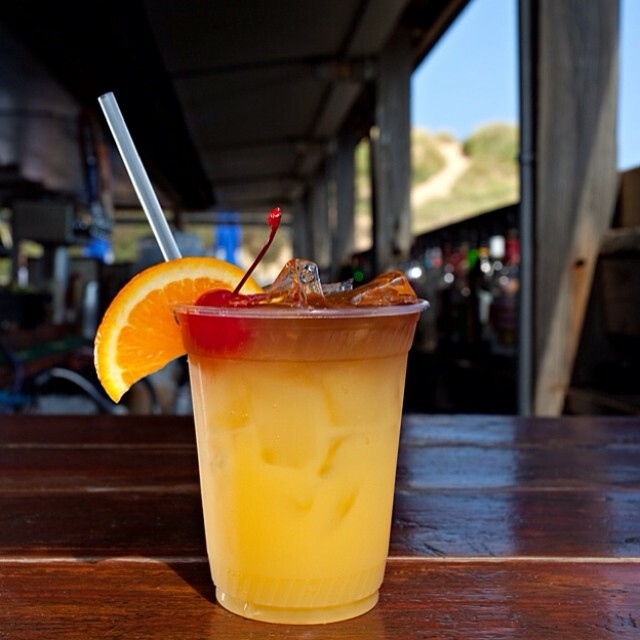 Settle into a seat at the bar to enjoy the view of the ocean with your Kiwanda Cream Ale, India Pelican Ale, or MacPelican’s Scottish Ale, then wander out to the beach patio to watch the dories bob, the surfers surf, and the sun settle over the Pacific. Toes-in-the-sand beach bars are shockingly scarce in SoCal, and exclusive Malibu is one of the last places you’d expect to find a laid-back hangout dotted with potted palms and beach umbrellas. Order a rum smoothie made with real fruit (because, California) and chill out on a lounge chair to soak up the same views Hollywood celebs spend millions to enjoy. Like the New England summer, Paddy’s season is fleeting, but for a few warm, glorious months this Rhode Island beach bar is the hottest place by the shore in southern New England. Walk up to the outside bar for tiki drinks on the patio or get your VIP on at Tikki Beach, where you can lay claim to a lounger or cabana in the sand. Live bands, foam parties, and other shenanigans keep the fun going after sunset. When they tell you to come in and cool off at this coastal Carolina hangout, it’s meant literally: customers saunter into a walk-in cooler to choose their favorites from a selection of more than 350 beers. Sure, it’s a couple of blocks off the shore, but the sandy “Pelican Beach” out back has a bar built out of an old boat, Adirondack chairs for lounging, and a cow surfing across the roof. Sitting astride the Florida/Alabama border on Pensacola Beach, the Flora-Bama provides a shot of Spring Break party atmosphere 365 days of the year, with daily live music (Jimmy Buffett has played here), biking contests, 22 bars serving thousands of festive beachgoers in a rambling roadhouse, and a series of decks overlooking a broad expanse of beach. The closest thing to a beach bar near the nation’s capital, Tim’s sits on one of the widest points of the Potomac River and channels its beachy vibe with soft-shelled crab sandwiches, live music on the dock, a torch-lit tiki bar, and—yes—a beach. You can drive here, but the stylish way to arrive is by boat, water taxi, or seaplane. 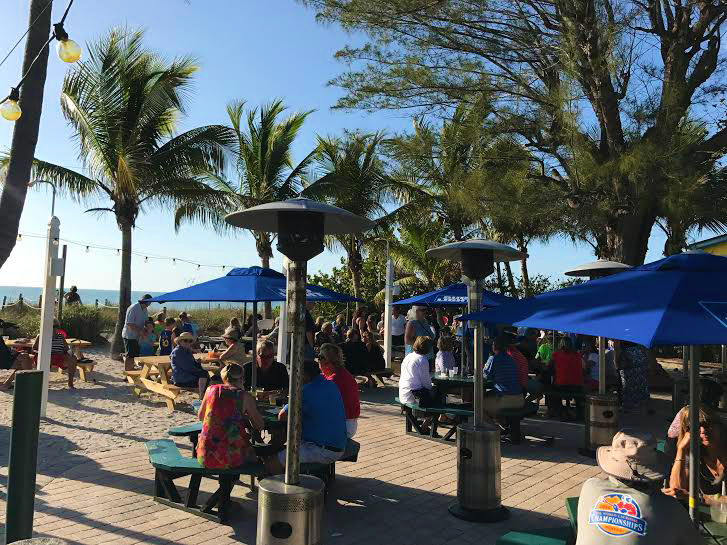 Mix the ambience of a traditional English pub with the informality of a Caribbean beach bar and you’ve got the Mucky Duck, a Captiva Island restaurant, bar, and inn where you can wade ashore from your boat for fish and chips and a cold beer on draft. Regulars plan island visits around sundown at the Duck: check the calendar on the website for sunset times every day of the year. Islands have always attracted oddities, and Madeline Island in Lake Superior is a prime example of how creative minds turn lemons into funky lemonade. Flotsam, jetsam, and sailing canvas comprise the bulk of Tom’s Burned Down Cafe, rebuilt in seemingly haphazard fashion after a devastating fire. Cooled by breezes off the lake, it’s part open-air bar, part art gallery, and all a monument to perseverance and good times. This coastal Alabama institution—it’s been around since 1956—has been battered by hurricanes but still stands in all of its garish glory on Gulf Shores Beach, serving up local seafood with Creole flair and rum-soaked Bushwacker cocktails to all comers, from bikers to debutantes. Big doors open onto the beachfront patio so you can soak up the sun while grooving to sounds of karaoke or live music wafting out from the bar.